I had to stop working on my HT room a while back because of injury I did to my right shoulder. But that's 95% healed now. The room is so hot that I can't work in it for very long. I take Monday afternoons off for this purpose. I'm buying a small 8,000 BTU portable air conditioner / dehumidifier for $300 this weekend. 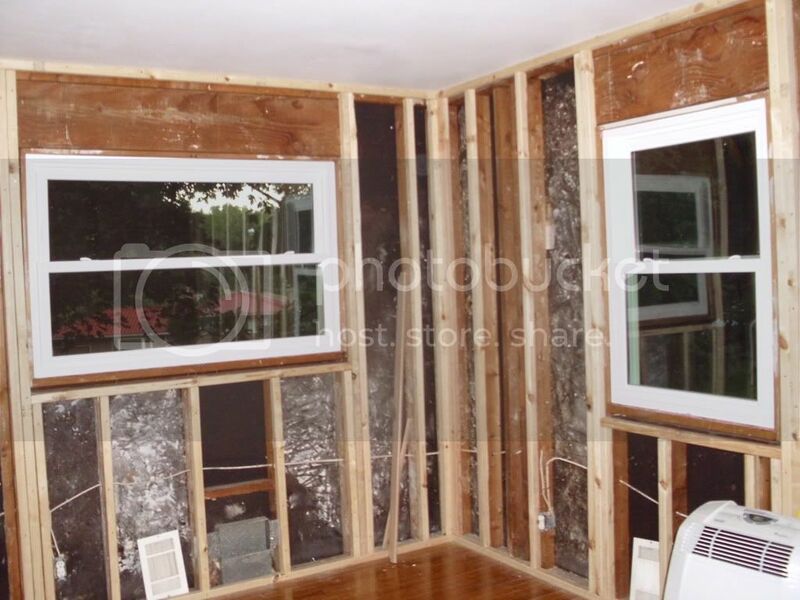 I've also found someone to replace the 2 windows in the room for $884. I pay half and sign their contract for work this Friday. Rolox wanted $2800, Sears wanted $1800. The private contractor I found only wants $884 for triple pane vinyl windows which includes installation. They look somewhat better than what Sears is selling. The windows are Heartland windows. I bought a medium green paint for the walls. I'm going to install one electrical circuit at the computer end of the room, and another new circuit for the remainder of the room, plus 4 recessed lights. I'm not too keen to crawl around the attic because I know that silverfish live up there. I guess I need to make some traps for them by combining some sugar and borax, and installing some of those sticky trap boxes. Maybe put something real tasty in the middle of the box that only silverfish would go out of their way for. Look at you, being all demolishy-buildy. Silverfish won't hurt you. Hit that attic. "I'd hit that like an attic full of silverfish!". While I'm thinking about it, I'm going to add some wood to the spots where I want to mount a couple of M3's. I'm thinking boxy M3's about 2-4 feet down from ceiling on the wall I'd be primarily facing. Need to order some more speaker wire. I'd also like to get some sort of stereo receiver / CD player for this room. One option, although a little pricy is Marantz M-CR603 Network Stereo Receiver with CD player for $699. I'd prefer the silver model to match the intended decor. Room colors/materials will be green, white, chrome, glass. I plan on glossy white M3 speakers. I bought a 12000 btu portable room air conditioner for this room, and it sure helps keep it comfortable while I'm working in there. I plan on leaving it in this room for extra cool during really hot days. (At least it's white.) I'll be venting it to the garage, which is just a hole in the wall from this room. New replacement triple pane windows should be installed in roughly 2 weeks from now. Be sure doing this is up to code. As I understand it, the powers that be don't like openings from garage to house due to the potential of exhaust fumes getting into the house. Just check before drilling holes. Probably would be good to design it so that fumes can't get into the room. I'm not too concerned about building code with this, since just adding wood to both sides of the hole fixes the problem. There is a ceiling vent with a turbin on it in the garage, so there's good ventilation there. I'm the only one that lives there and I don't run my engine in the garage any more than I have to. When the a/c is out of season, it'll be plugged up. I plan on cutting out round pieces of sheet insulation that will fit snugly into the pcv pipe that's in the hole. They will be loosly bolted together with large outer washers. Then a cap fitted onto the pcv pipe on both ends. I agree, the insect will eat everything causing a lot of damage. They love moisture so if you can reduce that then you might be able to get rid of them. I've found they mostly eat paper. And that's bad. Yeah, since my main bedroom just below this ceiling on the other side of the wall is covered in multiple layers of wall paper. The new windows were installed yesterday. Yeah! One more step closer to getting this thing done. I also have the 2x2's (well actually 1.5 x 1.5) glued and nailed to the edges of the 2x4's (1.5 x 3.5). I think the next steps will be running new electrical, removing old attic insulation, calling exterminator, installing new ceiling lights. Here's a picture of a similar room I have in mind. Same furniture, similar wall color. It has large square white tiles on the floor that I want for this room, but I haven't been able to find any like it. They don't look like your typical floor tiles. I can't tell what they are made of. They look to be about 3 feet per side. One alternative would be a very short nap white carpet, but this might be hard to keep clean. I don't want to leave it in hardwood, because the rest of the house is hardwood. I want something light and cheerful.